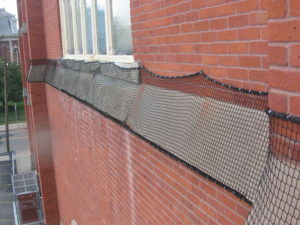 Shrink netting was installed both as a temporary stabilizer and as debris containment system. As protection against water infiltration a discrete colored sealant was applied at locations deemed permeable. Repaired and improved a selection of hardware supporting the perimeter fall protection net at the Helipad. A netting system was designed and installed over the Center for Arts skylight to contain any panels or laminations that may have become detached on the exterior side of the skylight. 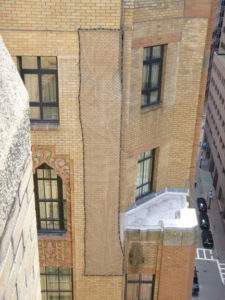 Installed a temporary stabilization system to mitigate the hazardous conditions at the exterior of the masonry on the tower. 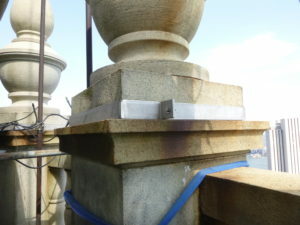 After installation of stabilization a full restoration of the tower was completed. Using stainless steel straps ornamental masonry was temporarily stabilized. 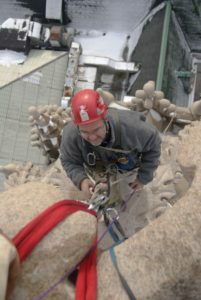 By using rope access techniques there was minimal disruption to building occupants and pedestrians while working above the courtyard. 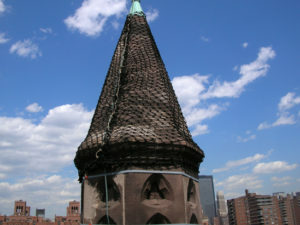 In order to contain areas of cracked, displaced and loose masonry temporary stabilization measures were designed and installed on four conical tower turrets and four octagonal Chapel turrets. Custom shrink netting was cut to the shape of the turret and held in place by a rope encirclement. 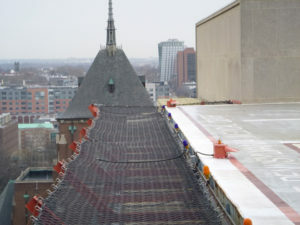 Stainless steel strapping was installed around the freestanding drum portions of the tower turrets and the crown and brownstone units at the Chapel turrets. The challenge of accessing the turrets was solved by using industrial rope access techniques, rendering this difficulty a moot point. As part of the temporary stabilization work, fragments of stone and patching material was removed where the deterioration of these materials presented unsafe conditions. The loose material was removed with the assistance of hand tools. 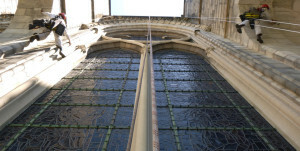 Netting was installed as a temporary mitigation measure at one stone belt course at the east transept wall and one belt course at the west transept wall. 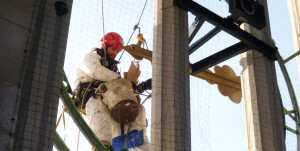 It is held in place with a continuous ½” diameter perimeter rope. The perimeter rope is woven through the netting, and the netting is further attached to the netting with crimped metal rings. All work was completed using industrial rope access. In a time sensitive situation loose pieces of granite were removed from the south faces of the nave and clerestory and the east façade of the south tower to prevent dislodged stone from harming the public below. The work was completed using industrial rope access techniques over a span of 5 days, the time necessary for the assembly of scaffolding or swing stages. Follow up projects included mitigation work on the entire west facade, the north side of the nave and the north crossing. 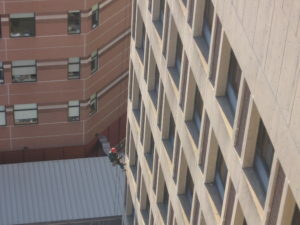 Removed potentially unsafe conditions at the exterior facades of five buildings of the Children’s Hospital Boston. The scope of the spall mitigation work at Enders, Fegan, Farley, Bader and Hunnewell Buildings was specified on elevation drawing prepared by the client. 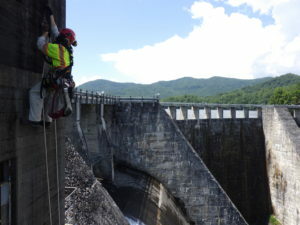 Industrial rope access was used to allow technicians hands-on access to perform the work. Loose and delaminating masonry was removed in difficult to reach locations as part of a temporary mitigation program. 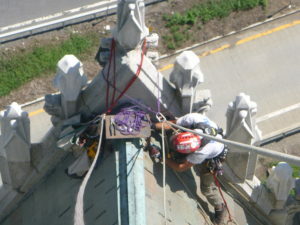 Alta Access was retained by the State University of New York (SUNY) to assist with the removal of the light fixture on the east side of the tower illuminating the spire of the SUNY Administration Building in Albany, NY. This was done as part of a larger lighting re-design and replacement effort. Alta provided rigging and construction services to remove the required light fixture on the east side of the tower’s pyramidal roof. Following the removal, temporary waterproofing was applied while the associated electrical conduit was capped. • Power washed Blocks 3 and 4. • Installed anchorages at the gate house for a suspended scaffold system and associated fall protection system. • Developed plans for and assisted with construction of work platforms at the base of Block 5. • Assisted with the removal of the work platforms at the base of Block 5 at project completion. • Documented major seepage locations at the downstream face of the right abutment. • Stabilized two pipes on the northwest face of the gate house. 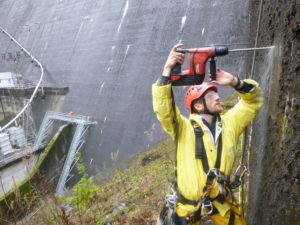 Designed and installed a horizontal lifeline system on the outboard side of the dam’s spillway. The system enables safe access to a previously inaccessible area at the site. 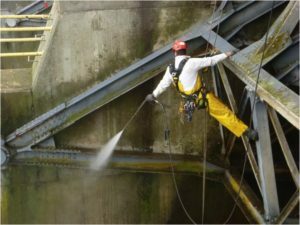 To aid the team in hands-on investigation of the five radial spillway gates at Eucha Dam we used power washing equipment to remove heavy soiling at select areas of radial gates to permit unobstructed investigation. For the new Breazzano Family Center for Business Education in Ithaca, Alta Access recently assisted the general contractor by finishing up the installation of bolts, mullion covers and sealant at the interior atrium, performing touch-up painting, and drywall repair work in order to expedite completion of construction due to complexities of access. Removed, refurbished and reinstalled with new gearbox components the hour and minute hands on four tower clocks at Keating Hall. The clock hands on Martyrs Court were removed permanently. Each clock hand is approximately 6 feet long. 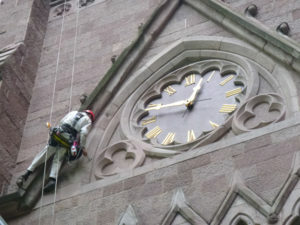 Industrial rope access was used to allow a technician hands-on access to clock hands and gear boxes. This access approach allowed work to take place without disrupting student and staff access to campus buildings and without the construction of costly scaffolding. 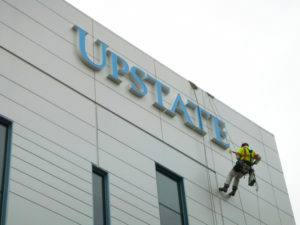 Installed 1 meter tall letters spelling “Upstate Cancer Center” on the new hospital building using industrial rope access techniques. 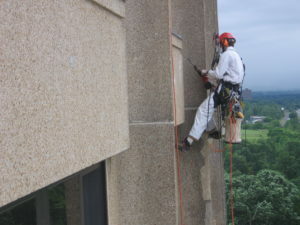 Numerous spalls in pre-cast concrete panels at a Syracuse University dormitory were repaired. Square profiles were cut around spall locations and each was filled with a repair mortar and aggregate was embedded in the mortar to match the surrounding facade. 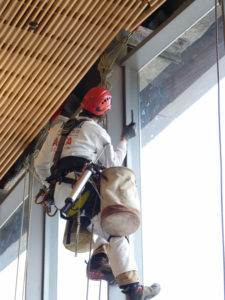 Rope access techniques were used to allow technicians access to spall locations. *Alta Access LLC was founded in 2015 by the partners of Vertical Access LLC. All project experience referenced above was performed by Vertical Access LLC unless denoted with an *.